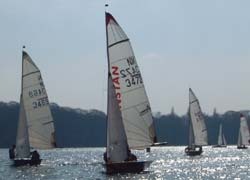 Visitors from as far away as Surrey and Tynemouth joined the local fleet at Olton Mere on a bright and gusty day for the first event of the Midland Area Series on 15 March. In the first race, early leaders Mike Cooke and Helen Hunt were eventually overhauled by class chairman Graham Camm sailing with Zoe Ballantyne, who built up an unassailable lead during the remainder of the race. In the second race, Camm and Ballantyne again pulled through into a comfortable lead to take another first place and the event. Despite their swimming antics in race two, Cooke and Hunt’s second place could still be threatened by the very fast local team of Matt French and Harriet Grimshaw, who had been a close third in both races. A final race showdown loomed for these two teams, though it was Tim Laws borrowing Camm’s boat and, crewed by the chairman himself, who led for several laps. Laws and Camm were eventually passed by both Cooke and French, with Cooke having the upper hand. However, a port-starboard incident at a mark saw Cooke spinning around while French and Laws sailed past. A major fight back by Cooke and Hunt saw them regain and extend the lead to secure second overall, with French taking third overall and first in the Admirals Cup fleet.